Small and medium-sized enterprises (SMEs) in Singapore expect their sales and profits to pick up in the second half of this year, but growth would not be as rosy as in previous years, according to an SME sentiment index by the Singapore Business Federation (SBF) and DP Information Group. Based on 3,000 interviews with SME owners and managers, as well as the actual financial performance of the SMEs, the forward-looking index tracks five industry sectors - commerce/trading, construction/engineering, manufacturing, business services and transport/storage. DP Information Group managing director Chen Yew Nah was not surprised that a second half bounce is expected, as SMEs are usually more optimistic about their second-half prospects. "Traditionally, there is a jump in outlook for turnover and profits among SMEs for Q3 and Q4," she said. Indeed, the index score for turnover expectations increased from 5.36 in the last quarter to 5.42 this quarter, while that for profitability expectations went up from 5.12 in the last quarter to 5.21 this quarter. However, these scores were lower than those from the same quarter in previous years. Ms Chen said that the reasons for a much more subdued second-half bounce this year are many and varied. 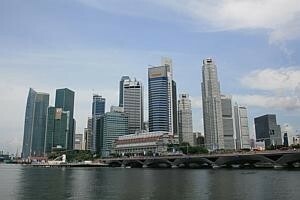 "Global trade has not picked up significantly and the Singapore dollar continues to remain strong. Many SMEs are (also) focusing their attention on productivity improvements as they adjust to higher labour costs," she said. The current index, which tracks SME sentiments for the six month period from July to December 2013, dipped slightly from 54.80 in the last quarter to 54.10 this quarter. A reading of above 50 indicates an improvement. SBF and DP Information Group said yesterday that this score indicates that SMEs are still slightly optimistic about their overall performance prospects in Q3 and Q4, but they are well short of being confident. Most worryingly, the construction/engineering sector has seen four consecutive quarters where its profit expectations have deteriorated, and this quarter's index score of 4.98 - an all-time low - indicates an expectation that profits would shrink in Q3 and Q4. On the other hand, capital investment by SMEs is at its highest point since the middle of 2011, continuing an upward trend over the last five quarters. Ms Chen said that increased capital investment indicates that SMEs are pursuing productivity improvements in their operations, which should lead to greater profitability in the future. Business expansion expectations have also continued to trend upwards as SMEs look for new ways to drive growth, in a sign that SMEs are confident of their strategies to drive growth, which include targeting new markets or introducing new goods and services. SBF chief executive Ho Meng Kit said: "The pick-up in investment and business expansion indicators are encouraging signs that SMEs are making concerted efforts to drive growth by investing in better processes and equipment rather than through manpower increase."